Did St. Ignatius of Antioch REALLY Believe in Transubstantiation in the 1st Century? A friend and fellow pilgrim got in a row with a friend on Facebook and asked for my help. You might enjoy the question and the answer. My friend wrote: “I have a quick apologetic question. A Protestant Facebook page was denying the Eucharist and I pasted St Ignatius’ quote about the Eucharist, “Let us stand aloof from such heretics. 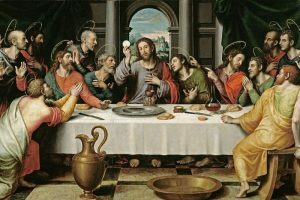 They abstain from the Eucharist and from prayer, because they confess not the Eucharist to be the flesh of our Savior Jesus Christ, which suffered for our sins, and which the Father, of His goodness, raised up again.” (Ignatius of Antioch, “The Epistle of Ignatius to the Smyrnæans). 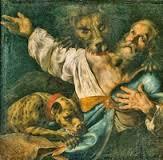 (Picture to right: Ignatius of Antioch eaten my lions in 106 AD). “I am not sure what he is referring to other than that in the 1200’s Aquinas defined Transubstantiation in terms of Aristotelian philosophy of substance and accidents. It is a trick question to get you to admit that St. Ignatius did not know about transubstantiation in Aristotelian terms and therefore did not believe in transubstantiation. The truth is — doctrine develops over time. For example Ignatius would not have described the two natures of Christ in terms of the hypostatic union nor the Trinity in the sophisticated words of “generation,” “proceeds” and “spiration” that were later used to more carefully and philosophically define what orthodox Christians had always believed but were later developed further to combat the heretics. 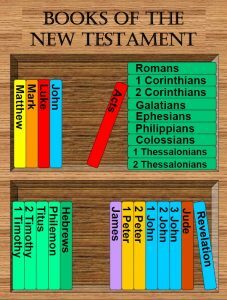 Even the canon of the New Testament took 400 years to develop and close; neither St. Paul nor Ignatius could have rattle off the 27 books of the NT since that also took time to develop into the canon used by your Protestant interlocutor, though he doesn’t realize that. By trying to trick you he steps in his own trap. Ignatius believed in the real presence of Christ in the Eucharist, the two natures of Christ, the Trinity, etc. though he would not have used the sophisticated words later developed to define these things more precisely and deeply. The little sapling doesn’t look like the big oak tree but they are organically the same thing. The baby pictures of your challenger may not look like him as a full-grown man but he’s developed over time and is still the same organic person. Theology also develops and takes on new words and explanations but is only a further development of what was already believed by the early Christians.